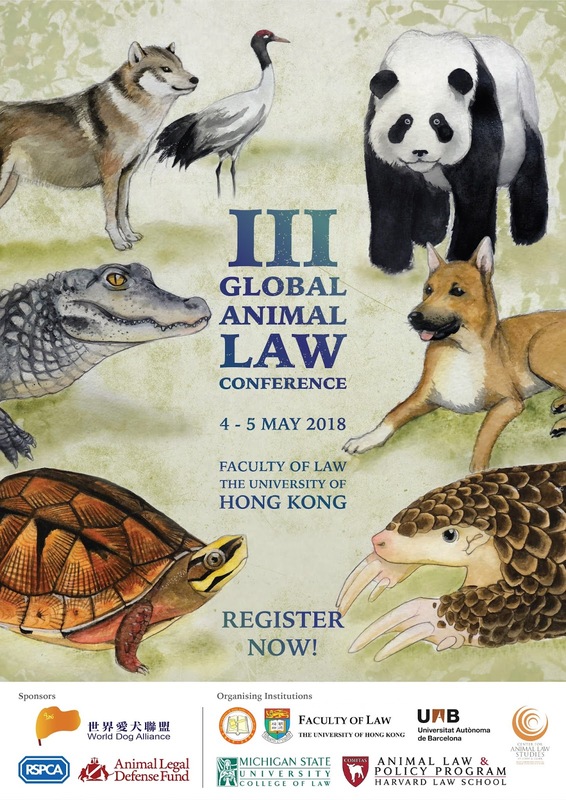 III Global Animal Law Conference hosted by HKU Faculty of Law will be held on 4-5 May 2018 (Fri-Sat) at Large Moot Court, 2/f, Cheng Yu Tung Tower, the University of Hong Kong. The purpose of this Conference is to bring together experienced legal thinkers and writers in the area of animal law, in order to learn about how the different legal systems of the world are dealing with animal issues in their respective countries. Speakers from 17 countries, representing over 20 universities will be present. Many of the speakers have authored important books and articles in the area of animal law. Most of the speakers come from a legal academic background. Sponsoring academic institutions are The University of Hong Kong Law Faculty, Michigan State University College of Law Animal Law Program, Lewis and Clark School of Law Center for Animal Law Studies, Universitat Autónoma de Barcelona Masters in Animal Law, and Harvard Law School Animal Law and Policy Program. To view the Conference details, please click here. To register, please click here. For enquiries, please contact Ms Winnie Law at winniewm@hku.hk. Can I share the conference? And can I have the list of universities which will be present? The e-mail address mentioned winniewm@hku.hk returns my e-mails. Here are the speakers that were present during the conference in Birmingham, AL (2018 Law Conference) with the materials shared and 7th Annual BCLT Privacy Law Forum (with the essay writers Marvin Porkers and Julia Wax). Perhaps they will be present this time as well.